Mix these organic green teas and botanicals to create your own delicious, restorative tea blends. Tea is a profoundly sensual pleasure, and not only when you drink it: the ingredients are often beautiful and always wonderfully aromatic. 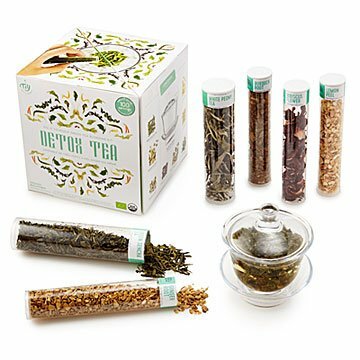 With our all-organic Detox Tea Blending Kit, become familiar with these spices, botanicals, and teas before you brew and drink them. Mix them together and experiment with delicious, soothing, restorative blends of your own invention. You can make about 100 cups with the ingredients included: Green and white tea leaves, dandelion root, burdock root, hibiscus flowers, milk thistle seed, ginger root, and lemon peel. Instructions, recipes, and an elegant, traditional glass gaiwan—designed to steep your tea to perfection—complete the kit. Sourced internationally. Assembled in Canada. My husband got me this gift because I am new to drinking tea. This tea tastes better than green tea bags from the grocery store. It's fun to learn about the ingredients. The glass seems small but is an interesting concept. I think if i make tea for two I might use our french press. But instructions do say you can make a cup and use the same tea leaves over again. So, that is cool. The tea leaves really get bigger when you add water. The tea should be brewed at a temp lower than boiling so I might need to get a thermometer. But our first cup was good and it's fun to experiment! I love experimenting in the kitchen, so this is a good gift. The idea behind the gift is cute. Teas in separate vials like chemistry lab and instructions for mixing. The glass infuser however was not wrapped in bubble wrap and was broken all over the bottom of the box. I bought this kit as a gift for myself and I just loved it! The booklet is interesting to learn about all the different ingredients, and the blend taste really good! I hope they can also create similar kits with different ingredients! My mom is super health-conscious so I was really happy to find this product! Can't wait for her to open her christmas gift!